I just bought a 1989 International short bus. I have parked it on my property, plan on using it as an “extra room”. The folding front doors can be secured on the inside by a lever next to the drivers seat. But I haven’t been able to figure out an easy way to secure the folding front doors from the outside. I’m searched this site, but haven’t found anything on this. I’ve attached a photo of the doors. Thanks. I have an 83 Int and I still climb out the rear door when parking for the same reason. I have thought of a few idea's but I do like the replace the whole thing idea. Welcome! I'll think about it a bit more this weekend and post any idea's I have. Pics are always a crowd pleaser just an FYI. I kinda like these. Something to use while you wait for the replacement to arrive. I got two eyes with a threaded end on them from a hardware store. Then drilled a hole on each side of the door about eye level and bolted the eyes in there. Then I have a solid steel bar about 10" long with a hole in one end and a washer welded on the other that I slide through the 2 eyes and put a padlock through the hole. Ill post a picture when I get home. That setup works great actually. If you mount them right they won't interfere with the doors operation. Plus the puck (lock) is heavy enough to beat someone down if they try to steal your bus. Thats why you carry "the Club". I remember hearing about a 60yo lady who was almost carjacked at gun point in LA. But, lucky for her that she carried "the Club" as she used it to beat the crap out of the guy as she called the cops. I also remember falling off my chair when I saw the officer make a statment about it on the news... oddly enough, he did it without smiling once. I kinda had the idea to mount those brackets on both the inside and outside of the doors. I figured that if you are inside and wanted to lock the door, just use the same lock. But its a rather silly idea. I found mine at Home Depot. Came with both the lock and the bracket together for around 30 bucks. Here is the link to it on master lock's site. They seem to show the two parts separately. Thanks for all of your responses. I have attached a photo of the bus when it was in the bus yard, just before we brought it home. We live in the country, have parked it on our property. It was my wife's idea to get a school bus, and she insisted on a short bus because “they're so cute". OOOOOOOK. We are looking at using it as an extra room, a place where she or I can go to take some time from each other. We think it will also be a great place to stay for those of our family and friends who are so inclined. At this point, we don't plan to do any major conversions to the bus. We have taken out almost all of the seats, plan to put in a wood stove for heat (we live in the country and have plenty of wood) and play around with painting the bus inside and out. That's about all we've thought of so far. I don't have plans to actually drive the bus, though it certainly is drivable. Since the bus has reached what may be its final destination, I put some concrete cap blocks underneath all the tires, to keep them off the dirt. I plan on starting the engine every few months to keep it from seizing up (or whatever engines do when they're not run). When we were looking for a bus, I came across a website that North Carolina has for its surplus (read “well used”) school buses, http://www.ncschoolbussales.dpi.state.nc.us/. I imagine other states may have similar sites. We were lucky to be able to find this bus on that site, as most buses seem to be the larger variety and, for our purposes, the prices seemed reasonable. I've been looking for a SIMPLE solution to locking the front doors. 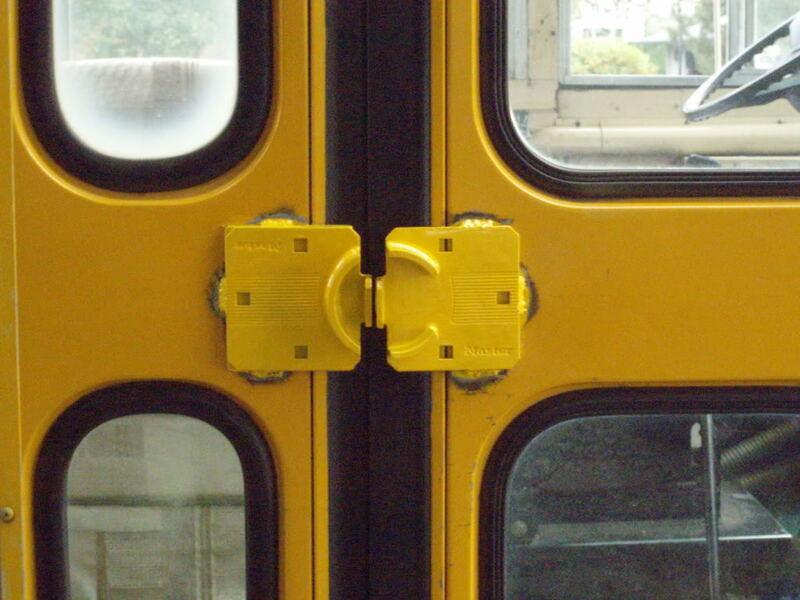 I like the puck lock that TKFT used on his bus. How did you attach it to the bus? From the photo, you didn't use nuts and bolts. Kamoo, I'm looking forward to seeing a photo of your lock, as I'm very visual, and don't understand exactly what you described. As for the wood stove: since we don’t plan to live in the bus full time or even sleep in it during cold weather, I’m wondering if a SIMPLE wood stove might fit the bill. Here are 2 on ebay that look interesting. What do y’all think? Thanks again for your thoughts and comments.